Modern medical technology combines medical technology with information technology. Improvement in the accuracy and efficiency of on-site medical rescue is an important strategy for the development of intelligent medical service. In order to achieve intelligent medical care monitoring, the first vital step is to ensure that the patient's physiological condition is mastered accurately according to the monitor terminal. This ensures that correct guidance is made towards improving the success rate of medical aid. Therefore, intelligent medical monitoring terminal software system was designed in this study. The functions of the system were in line with the modular design expectation. Module design was carried out from scene environment, patient physiological data and communication. Implementation of intelligent medical monitoring terminal software system can provide technical support for improving the level of medical services. It was confirmed by testing the function of the software that it could collect the patient's physiological data accurately. The scene of the environment was controlled through audio and video. Moreover, complete data upload and storage were accomplished quickly, which is of good practical value. With the reforms in the medical system, family-oriented medical service has become the main feature of medical services. In medical aid, the accuracy and timeliness of treatment are the keys to successful health care. Limited by traffic, locale and other factors, professional medical staff are usually unable to access the patient in time. Moreover, the personnel on the scene lack the knowledge of ambulance aid and so delay the rescue, a situation which may lead to deterioration of the patient’s condition, or even death . Therefore, intelligent medical remote service system is necessary. When a medical emergency suddenly occurs, the intelligent medical remote service system is able to perform simple, timely and proper treatment by remote guidance, thereby ensuring successful treatment . The modular design concept can separate the specific functions of the system independently; this helps to maintain and extend the system. At the same time, clear software structure can improve the efficiency of software development, and help system developers to successfully complete the development and application of the system . Telemedicine service is relatively a new field in the development of medical service. In telemedicine, the most important objective is to remotely make the medical staff understand the patient's real situation and accurately in order to guide on-site personnel to take the most effective way and method for first aid treatment. Thus, intelligent design of the monitoring terminal is of critical relevance in telemedicine . In China, the development of telemedicine focused mainly on infrastructure as early as in the twentieth century. In the mid-80s, construction works were started in a venture involving three major nationwide telemedicine networks dominated by the Ministry of Health Project (GHN), IMNC network and telemedicine network of PLA . In order to address the China domestic imbalance in distribution of medical facilities, regional central hospitals in many provinces embarked on the development and construction of telemedicine networks in their respective areas through the policy and financial support from the Ministry of Health and the Ministry of Science and Technology . According to the WHO report on implementation of telemedicine system in member countries, only 25% of countries have telemedicine policy or strategy, but only 20% of these countries have either fully implemented, or are beginning to implement the national telemedicine policy or strategy . However, many problems do exist in the current system of medical aid, such as slow upload speed and inaccurate information collection. The purpose of this study was to improve the success rate of medical aid. Therefore, the software system of intelligent medical monitoring terminal was studied in this paper. The system integrates the physiological parameters and physiological manifestations of the disease to guide telemedicine service, and it can be applied to families that lack medical knowledge and the need for long-term external medical care for patients at home. In some health care systems, intelligent medicine service has become a more popular approach to management of user health consulting and treatment. Related medical systems and research contents are also abundant. The functions of the intelligent medical software indicate that the applications of system are divided into pharmaceutical information software, medical reference software, and decision support software; educational tool software, tracking service software, medical counting software and health care software. These software constitute a relatively complete system of intelligent medical information service . Intelligent medical software has been classified into two categories. One of them is software that helps users form good habits, and the other is software that transforms data from artificial intelligence devices into medical data . In the specific application of the software system, design software which can make an appointment and to seek medical treatment has been developed . The software can help users schedule a specialist remotely and make appointment for registration. In addition, the software can directly establish a communication platform between patients and doctors through the instant service function. Patients can send feedback to the doctor directly, and professional answers are given by the doctor. At the same time, the software can search the key word through the user, and give the program inquiry service that accords with the treatment condition . Software for mental health has been developed . The software provides users with public mental health knowledge. In patients with different mental disorders, the software can tailor courses that meet their psychological needs. The software can centrally manage patients with the same pathology and provide targeted treatment by experts. In addition, software for diabetic patients has been designed . The system can help diabetics take their diet and drug injections regularly, and regulate their life pattern. States in the western United States launched the "healthy West" software in 2015. This software provides users with registered triage services and can also provide them professional answers to medical problems . An auxiliary diagnosis and treatment system based on Android platform has been designed and implemented . The functions of this system include network registration, drug knowledge inquiry, doctor resume inquiry, common sense first aid, and medical expense settlement. This system alleviates the difficulties faces by patients seeking medical care . An electronic medical record system has also been designed . This system can help doctors and nurses accurately diagnose the patient's condition, and also help patients in different hospitals to get medical treatment, thereby eliminating the extra expenses associated with reviews. An embedded mobile diagnosis and treatment platform based on Android system has been developed . This platform is involved in personal information management, patient record inquiry, doctor's order delivery and patient's automatic determination of physiological information. In addition, Al-Mansor proposed and implemented some new applications, such as the doctor's voice input, the rational drug use test and the automatic matching of drug name input . In terms of intelligence medical remote monitoring, data from visual and vital signs data are monitoring objects. Physical parameters of video, audio, and inspection equipment identification are viewed as a means of judging a patient's condition. Scientific operations performed by field personnel are conducted remotely, and this has become an important means of medical services in many developed countries . A cloud service database has been generated from studies on the pathological features of the common diseases in the elderly . Automatic matching is achieved by remote monitoring of the information obtained. Objective pathological data and treatment methods are given, and the application software of intelligent disease diagnosis by means of information technology is achieved . South Korea's Samsung Corp designed a Look at Me software for autistic children. The software allows patients to stay focused for a long time. It uses photos, facial recognition techniques and games to help patients adjust their moods and learn to communicate with people . Related research and analysis of terminal software of intelligent medical and monitoring software are still in the experimental stage. Although there have been individual applications, there are still many imperfections in functions and service; and the curative effect is not obvious to the patient. The main factor is the lack of innovation in software interaction. There is a lack of accurate communication between patients, patients’ family members and health care providers. In addition, there is no effective data support for the patient's condition. Therefore, in view of the current problems associated with intelligent medical treatment and software development technology, intelligent medical monitoring terminal software based on modular design idea was designed in this study. Theoretically, this type of software is a significant contribution to system research and treatment technology. In practical terms, it can provide a good application platform for the family-style modernized medical service while substantially meeting the needs of users in every field. Overall design: The design of intelligent medical monitoring terminal software was based on modular design theory. The purpose was to realize remote monitoring of medical scene through 3G network. The audio, video and physiological data of the scene were collected, encoded, compressed, stored and decoded in real time. Wireless (3G) network was used as the communication medium between the monitoring terminal software and the server, and it was completed by Wideband Code Division Multiple Access (WCDMA) wireless network. Data obtained by monitoring terminal software generated data that met the requirements of the database storage by encoding compression, and was uploaded to the database. Among them, the audio and video files were stored in the streaming media database, while the vital sign data was stored in the Structured Query Language (SQL) database. During the connection between the monitoring terminal software and the information acquisition equipment, USB was chosen as the standard interface to connect the camera, microphone and monitor. Data acquisition, conversion, coding, compression and transmission in different coding formats were carried out. Module thinking was used to guide the design. The system was divided into field environment monitoring module, patient physiological data module and communication module. The field monitoring module connected the camera and microphone through the USB interface, and collected video and audio information. It was compressed by audio and video coding. Data packets that met the storage requirements of the streaming media server were generated by packaging, and uploaded to the streaming server. The patient physiological data module received, analysed, encoded and transmitted the patient's vital signs data collected by the monitoring instrument, and generated data conforming to the SQL database standard. In addition, it uploaded the data to the SQL server via the wireless communication network module. Thus, the service center could view and analyse the audio and video files and vital signs data through the database, and make appropriate scientific guidance. The management of the monitoring terminal software can be operated through the WEB interface. The interface of the device and the status of the managed device were configured. The management function structure of the monitoring terminal software is shown in Figure 1. Figure 1: Monitoring terminal software management function structure. WEB interface management software four modules included wireless communication module, physiological data module, on-site monitoring module and system management module. Among them, the wireless communication module can configure network connections and view network status. The physiological data module can manage the medical instruments, set up the interface of medical instruments and match the server database Internet Protocol (IP). The field monitoring module can configure the streaming media server IP and receive the streaming media format and size. System management can view user IP address, software basic settings and software upgrades and other operations. In this study, the designed medical monitoring terminal software and hardware device used standard USB interface for data transmission. In addition to the camera and microphone and other common hardware equipment, the equipment also included professional medical instruments such as the portable blood glucose meter, portable Electrocardiograph (ECG), multi parameter monitor and portable blood pressure meter. The information collected by different hardware devices was transmitted to the software through the exclusive USB interface. The software was categorized according to the data type and encapsulated to meet the server data requirement standards. The web manager and the server database were connected together. They build access interfaces between the client and the database through the web application, and send requests to the Web server by using the Hypertext Transfer Protocol (HTTP) protocol. The server uses the JSP technology to access the database server according to the request, and encapsulates the read data into the JSON format. The server is then returned to the terminal via the HTTP protocol. The JSON is parsed by the service center resolution mechanism, and the data is presented to the medical staff in a fixed form. Medical staff can conduct remote guidance and treatment through video. The field environment monitoring module uses camera and microphone to collect, encode, compress and upload the image and sound data of the medical scene to form a real time interactive medical assistance mode with the service center. The monitoring terminal software connects speakers and microphones via the AC97 controller or the USB controller. They connect the camera through the USB controller to connect the audio and video equipment, and set up triggering mechanisms through drivers. They can control the hardware directly through the field environment monitoring module. The audio and video streaming transmission uses EMIPLIB (EDM Media over IP Library) open source database for audio and video data acquisition, coding, decoding, network transmission and playback. The original data of the audio and video is collected by the input module, and the original audio and video stream is encoded through the encoding module to generate a standardized module for network transmission. These data are transmitted via the IP network. Decoding module is used to decode and restore audio and video files, and players are also incorporated. This process is completed at the kernel layer of the site monitoring module system structure. Cameras, microphones and speakers are responsible for the acquisition of raw data as hardware, and the monitor terminal application is viewed as application layer software. The patient's physiological treatments entail encoding, sorting, compressing and transferring the physiological parameters of the patient collected by the monitoring instrument. There are many kinds of monitoring instruments, but the main items for examination are body temperature, respiration, blood pressure, ECG, heart rate and oxygen saturation of the blood. The standard of each parameter in normal human body is not unified. Therefore, data collection and processing should be standardized. The physiological data of the patient are collected and transmitted by encoding and decoding. The acquisition of information by the external equipment is monitored by software, and a data connection for the monitored messages is established. Data packets are received. The received data requires standard decisions, and data that conform to standard data are conducted to data coding to generate server-side database, which can identify and receive the data. Initialization is carried out to connect to the database and upload the data. The receipt of human physiological data is a constant process. The data detected by monitoring instruments contain many physiological parameters of human body. The acceptance of physiological data requires assessing the data to confirm that it is in line with the database reception standards, such as length and data packets. Data that is not up to standard is filtered. The passed data is uploaded to the server through the data sending module and the access rights of the SQL database are obtained. The data is then uploaded. USB was used as the interface of data communication in this study, and different types of equipment were connected in standardized form to communicate data. The connection of the USB device must have a host and one or more hubs and devices. It adopts master-slave communication mode. Different hardware devices adopt different USB specifications, resulting in problems of compatibility. Therefore, in order to reduce repeated development workload in the system, it was forwarded by the USB bus. The performance of device operations was conducted through commands. In line with the current USB specifications that Open Host Controller Interface (OHCI), Universal Host Controller Interface (UHCI), and Enhanced Host Controller Interface (EHCI), three USB drivers were added to ensure compatibility with the device when creating USB bus. In the aspect of wireless communication, 3G module was used to achieve the wireless communication function of medical monitoring terminal software. The network connection was completed through PPP (Point-to-Point Protocol). During connection, the connection device readiness was determined first. PPP dial-up networking was carried out after initialization. If the network was connected, the connection state was cycled detected. If it was not connected, the dialing was repeated. With the popularity of Wireless Fidelity (WIFI) applications, existing medical devices can be pre-assembled WIFI modules. The connection of medical terminal monitoring software and server connection is more convenient through the WIFI wireless network. Intelligent medical monitoring terminal software system can be seen by testing the function of the software to ensure that it can collect patient's physiological data accurately. The scene/ environment can be controlled through audio and video, and the upload and restore of each type of data can be completed quickly and completely. In this study, the designed medical monitoring terminal software can be configured with the remote service center to simulate the operation function of each module. The terminal equipment is connected with a camera, a microphone and a monitoring device. The software system connects to the server side through the 3G network. The data collected by the instrument is stored in the database and transformed into the remote service center signal, and the parameters of vital signs are restored and displayed. Audio and video are transmitted via coding and sent to the remote service center via the streaming media server. Using this software, medical professionals can provide and direct on-the-spot guidance. The medical terminal consists of two big data processing modules. One is audio and video transmission module. It makes the audio and video data collected to conform to the code compression stored in the streaming media server through the 3G network. The other is vital signs data transmission module. It generates standard data on the patient's life, such as heart rate, body temperature and blood pressure, and stores them in the SQL database. The service center is controlled by medical staff. It can obtain video and audio of the patient's environment through the server through remote observation. Thus, the patient's condition can be assessed, and the emergency treatment measures taken by the patient are evaluated by vital sign parameters returned. In this study, monitoring instrument was chosen to carry out that test by means of simulation platform. The hardware equipment was camera, multimedia codec, AC97 audio controller, monitoring equipment and computer. The patient physiological data module test evaluated the accuracy of the spot vital data collected by the software system and the monitoring instrument connection, and tested to see if the software can accurately transmit human vital signs data. SQL information storage was carried out through the server side. Life royalty data was called through service center. The collected life characteristic data were stored in the information data sheet of SQL database in a uniform and standard information format. Vital signs such as heart rate, blood pressure, temperature, blood oxygen, and respiration were examined in the service. The testing of patient physiological data acquisition and transmission function was the basis of checking the communication between monitoring terminal software and SQL server. At the same time, it also verified the effect of the remote service center on the monitoring of vital signs in the field terminal. The parameters of vital signs parameters could be seen through the physiological data module test, and comparison with the field test showed that the results were consistent. Thus, it was ascertained that the patient's physiological data processing function test results were correct. The audio and video field environment monitoring module test was used to test the accuracy of the audio and video files collected by the software system and the camera and microphone connection, and to test whether the software could capture accurate pictures and sounds. The storage of streaming media information was carried out through the server, and the audio and video files were called through the service center. The collected audio and video files generated standard and canonical information format of the system by coding and compressing. They were stored in the information data table of the streaming media database and were able to view the audio and video files in the service. The results showed that they played successfully. The test of field environment monitoring function was the basis for checking the communication between monitoring terminal software and streaming media server. At the same time, it also verified the effect of remote service center on field terminal monitoring and control. Through on-site environmental monitoring module test, the picture of the scene could also be seen, and live sound could be heard at the same time. Thus, the test results of the on-site environment monitoring audio and video viewing function were successful. The communication module test was used to test whether the communication functions between the terminal equipment (camera, microphone and monitoring instrument) and the server, and the server and the service center were unblocked. The communication function module was built on the basis of instant communication to satisfy the communication connection, message analysis, message routing and message sending. Test results of interface communication function met the requirements of real-time communication, and test results of communication function were successful. The results obtained from the collection, transmission and application tests of the audio, video and vital signs parameters of the medical monitoring software were in line with the software development expectation. Nowadays, with the rapid developments in information technology, mobile medical service has become a new field of medical service. More and more medical rehabilitation information technologies will be introduced to solve the problems of inadequate medical strength, poor medical rehabilitation treatment and low efficiency of medical rehabilitation work. Therefore, the application of communication technology and mobile application technology in medical service has a very good prospect. A design of intelligent medical terminal software system was the aim of the current study. Through mobile communication technology, medical staff can interact with patient families, and obtain realtime vital signs, audio and video images, so as to provide remote medical guidance. In this study, the intelligent medical terminal software system based on modular design concept was interpreted from the point of view of user demand and software development. A clear functional module system was built for the system. The detailed design process of each function modules was introduced in detail, including the site environment monitoring module, patient physiological data module and communication module. The results show that the system has good practical value. This study has some limitations. For example, the medical terminal monitoring system designed in this paper still has many deficiencies in the user data analysis function. At present, the system can only collect basic user information and users' application information, but it has not been extended to the application and development of large data. Symptoms of vital signs can be tapped by means of large data. After clustering analysis, accurate processing methods can be given automatically without human intervention. Therefore, medical services will become more intelligent through linear and nonlinear data relations as well as large data mining in future works. The work presented in this paper was supported by the Plan Project of Zhejiang Science and Technology: Research on hospital guidance medical information system based on indoor location, serial number: 2014C33079. Liang T, Yuan YJ. 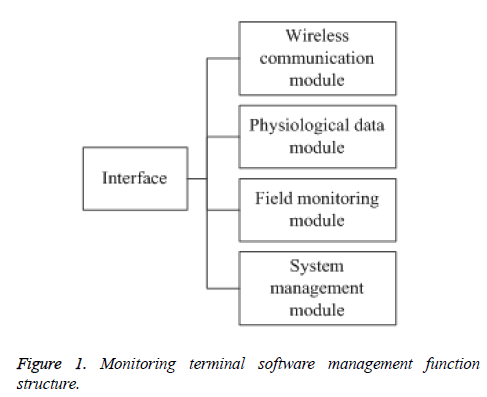 Wearable medical monitoring systems based on wireless networks: a review. IEEE Sensors J 2016; 16: 8186-8199. Shu M, Yuan D, Zhang C.PA MAC protocol for medical monitoring applications of wireless body area networks. Sensors 2015; 15: 12906-12931. Liu Y, Dong B, Guo B. Combination of cloud computing and internet of things (IOT) in medical monitoring systems. Autism Int J Res Pract 2015; 18: 58-62. Bekele E, Crittendon JA, Swanson A, Sarkar N, Warren ZE. Pilot clinical application of an adaptive robotic system for young children with autism. Autism Int J Res Pract 2014; 18: 598-608. Xue Y, Liang H. Analysis of telemedicine diffusion: the case of China. Trans Info Technol Biomed 2007; 11: 231-233. Muller CL, Anacker AM, Veenstra-Vanderweele J. The serotonin system in autism spectrum disorder: from biomarker to animal models. Neurosci 2015; 321: 24-41. Casartelli L, Chiamulera C. The motor way: clinical implications of understanding and shaping actions with the motor system in autism and drug addiction. Cogn Affect Behav Neurosci 2016; 16: 191-206. Guo J, Zhou X, Sun Y. Smartphone-based patients activity recognition by using a self-learning scheme for medical monitoring. J Med Sys 2016; 40: 1-14. Thompsonpaul AM, Wei SC, Mattson CL. Obesity among HIV-infected adults receiving medical care in the united states: data from the cross-sectional medical monitoring project and national health and nutrition examination survey. Medicine 2015; 94: 1081. Countries IM. A remote medical monitoring system for heart failure prognosis. Mob Info Sys 2015; 1: 1-12. Liu H, Dong W. Design of wireless medical monitoring system based on ZIGBEE. Comp Measur Contr 2015; 8: 391-398. Wang Y, Chi RH, Liu MH. Design of remote medical monitoring system based on Android mobile platform and Bluetooth HDP technology. International Conference on Software Intelligence Technologies & Applications & International Conference on Frontiers of Internet of Things 2015; 32: 144-149. Elayan H, Shubair RM. POn channel characterization in human body communication for medical monitoring systems. Int Symp Antenna Technol Appl Electromagn 2016; 2: 234-257. Medina J, Espinilla M, Nugent C. Real-time fuzzy linguistic analysis of anomalies from medical monitoring devices on data streams. Eai International Conference on Pervasive Computing Technologies for Healthcare 2016; 13: 277-283. Al-Mansor MJ, Gan KB. Current trends of communication systems in medical monitoring services: The case of WSNS operating system design. Research Gate 2016; 22: 17-27. Kiourti A, Volakis JL. Wearable antennas using electronic textiles for RF communications and medical monitoring. Eur Conf Antennas Propag 2016; 9: 1-2. Swiątkowska B, Szeszenia-Dąbrowska N, Wilczynska U. Medical monitoring of asbestos-exposed workers: experience from Poland. Bull World Health Organiz 2016; 94: 599. Barr DA, Haigh CA, Haller JM. Medical monitoring during Firefighter incident scene rehabilitation. Prehosp Emerg Care Off J Nat Assoc Ems Phys Nat Assoc State Ems Directors 2016; 23: 1.